What is the WANTED!! Lesson Wishlist? 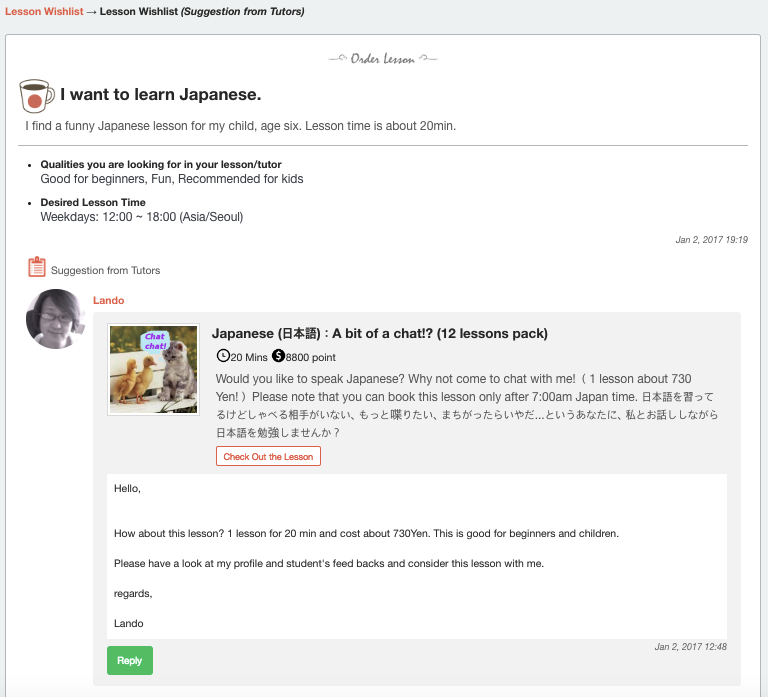 This function allows you to send out a post about what kind of lessons you’re looking for to all of the tutors on Cafetalk. We recommend using this function if you have specific learning needs or can’t find what you’re looking for among our current lesson offerings. The lesson wishlist button is under the "Favorites" button on your dashboard. From this page, you can either submit your order or check out what other students ordered. 4) What qualities are you looking for in your lesson/tutor? 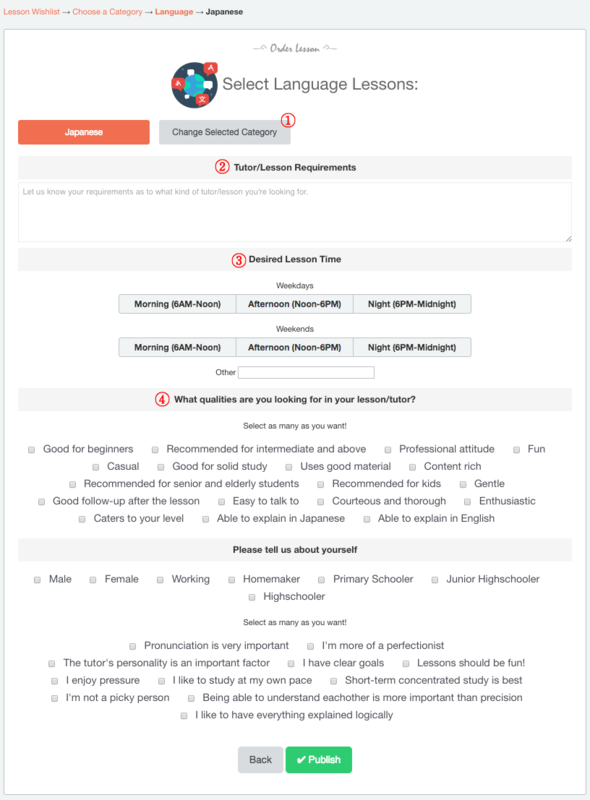 : Check the box next to the qualities that describe what you're looking for in a tutor/lesson. You can select as many as you'd like. Click the green “Publish” button to send your post out. You can check to see whether any tutors have responded to your order by clicking on the “Lesson Wishlist” button under Favorites in your dashboard. You can also choose to have an email notification sent to you whenever a tutor responds with a lesson suggestion. 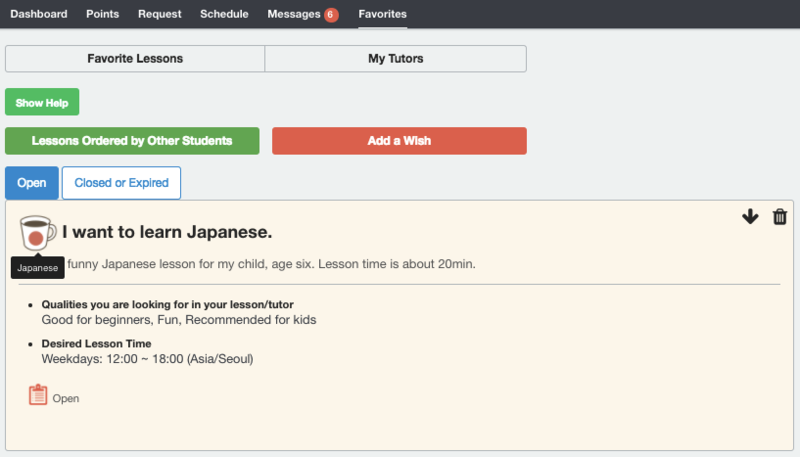 You should be able to see the number of lesson suggestions along with the tutors who sent them in. If you click on the number of suggestions or the tutor's name, you can read the message that the tutor sent to you. You can either send a response to the tutor's message or click “Check Out the Lesson” to see the lesson details.